It is still needlepoint, morning, noon and night! what could be better than that? I still work on my Mac editing stitch guides for Needlepoint Now. Wonderful and exciting projects that will make their way to home to you for your stitching pleasure! There will still be stitching adventures, thread shopping trips, trade shows, Facebook, ANG Seminar and classes with Brenda Hart, Susan Portra, Meredith Willett, Tony Minieri, The Embellishment Squad and too many more to mention! Not so much travel and teaching since the shop keeps me very busy! Mostly needlepoint you ask? Why? Well there are too many other things to talk about like my cats Sylvester & AlleyCat, better known as the “Brat”! Felix is the one you see pictured here and he departed for the Rainbow Bridge ooh too many years ago. I still miss you buddy. Oh by the way did I mention baseball? Tried to post on post entry would not post. Hope we get to see Mr.Crow all together, his parts seem to be something to crow about! There is a RSS feed on the side…I would think that you would click on that and add your email. I am looking for the stitch guide for the Labors of Love Toucan christmas ornament. Does anyone know where I can find it? Do you have more info on the DJ Designs “Geisha” from the 2013 TNNA market? The dimensions, and how much it might be? The DJ Designs website looks like it has not been updated in years. That is his (DJ Designs) retail store so he would have all the answers! My pleasure! hope you get the canvas…I absolutely love it! lucy@forever-emb.com for more information. Details of the San Francisco classes are listed on the RSN website. Thank you Marilyn! I will need to check that out! Which ones are you looking for? There are some Sundance colors and some not…I could send you some not Sundance Beads if that would help?! Glad to find fellow needlepointers, lately on my blog http://arsacupicturaestellae.blogspot.com I’ve finally been able to give step-by-step instructions for how to use Stitch Painter, a program that I love (note: my blog is non-commercial, and I get no payments or kickbacks of any kind, I share for the sake of passionate informing, only! ), I’ll start following yours, now, too. So sorry you won’t be with us at the retreat. Right there are 5 of us from Miami attending. oh no! who’s all going? Vicky, We’ve not met and I haven’t posted before. However, I so enjoy your blog. It’s one of the first things I read to kick off my day. On Oct. 10th, you posted a picture of a santa by Brenda Stofft. The fringe on his red jacket was perfect and I’m not sure how you created that. Is that simply Turkey Work without being cut? Or something more complicated. Thanks for all your wonderful posts. Thank you so much Penelope! Flattery will get you every where…I don’t believe that there was fringe on the jacket? His sleeves were stitched in a satin stitch (over padding) with Kreinik 1/16″ Ribbon 002HL. Now the blanket on the panda, that has the fringe which was done with beads. A whole lot of beads! 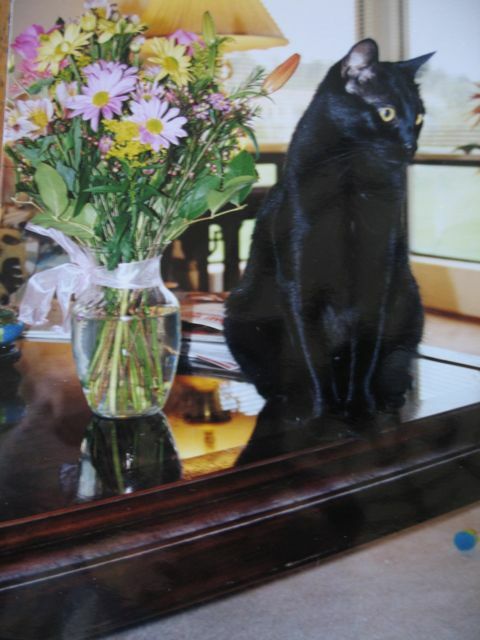 I had a wonderful black cat named Brat, too! I’m wondering if you can tell me which threads are featured in your column in the recent issue of Needlepoint Now. They are exactly the monochromatic grey colors I’m looking for. Checked access commodities thinking they were presented as a package but couldn’t find anything. I thought I was the only one with a brat! and mine sure lives up to her name. I sent you an email about the threads. Thanks so much! I love to purchase this image that is on your website (http://mostlyneedlepoint.com/wp-content/uploads/2015/02/maildog-needlepoint.jpg) Do you know where I can go to purchase it ? 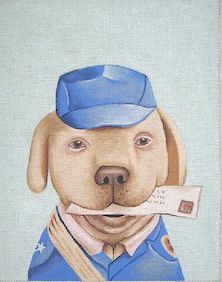 You would need to contact any needlepoint shop and tell them that you want to order Maildog canvas by Unique New Zealand! It was wonderful to meet you when we were in LaJolla for a wedding in September. I’m delighted that you are blogging more on this site ! I enjoy it very much ! I would like to personally congratulate you as your blog Mostly Needlepoint has been selected by our panelist as one of the Top 50 Needlepoint Blogs on the web. I personally give you a high-five and want to thank you for your contribution to this world. This is the most comprehensive list of Top 50 Needlepoint Blogs on the internet and I’m honored to have you as part of this! I’m looking for the canvas that you’ve posted on Pinterest and written about: Keep Calm and Love Dogs (in red with a paw print 8×11, 13 mesh- Unique NZ Designs). Can you help me out. Do you know who carries it? I’ve found the canvas in Blue with a dog on it but prefer the one you highlighted. Thanks so much. Love your work and posts! That was a custom paint… so if you find the canvas, some shops havea a painting service that can paint out the dog and add a paw print. We were trying to attract all dog lovers, rather than just a specific breed!